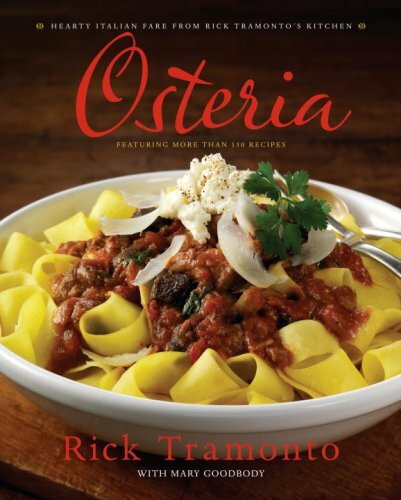 One of America's premier chefs, Rick Tramonto wows critics and diners alike with mouthwatering menus inspired by the comforting, family-style meals served in Italy's osterias (taverns). Now in Osteria Tramonto adapts these restaurant favorites for recipes ideally suited for the home kitchen. Easy to prepare and unfailingly satisfying, the recipes will transform everyday eating, from morning to night. There are breakfast and brunch dishes such as blood orange crepes and Sicilian-style eggs with spicy tomato sauce; lunchtime salads, soups, and sandwiches; and such delectable main courses as Rick's mother's Lasagna, Wood-Roasted Mussels in White Wine, and Lamb Porterhouse with Salsa Verde. Numerous small plates, including panini and crostini, provide a wealth of choices for snacks and casual entertaining. Desserts, such as Italian Chocolate Pudding, add a sweet finish to any meal. With stunning full-color photographs throughout, Osteria! is an appealing gift for anyone who appreciates good food. Rick Tramonto is the chef and partner at the award-winning Chicago restaurant Tru, and Osteria di Tramonto and Tramonto Steak and Seafood in Wheeling, Illinois. Named Best Chef in the Midwest by the James Beard Foundation in 2002, he has been featured in USA TODAY, The New York Times, People, and Gourmet, and has appeared on Today, The Oprah Winfrey Show, and Good Morning America. The author of six books, including Amuse Bouche and Fantastico!, he lives in Chicago, Illinois.